New Delhi, April 14: Low-cost carrier and top rival SpiceJet appears to be making the most of the crisis at Jet Airways. Spicejet is now hiring engineers and pilots at much lower pay than their current salaries at the financialy-troubled Jet. Industry sources told IANS that pilots from Jet Airways are being asked to take salary cuts of 25-30 per cent while engineers have been advised to settle at 50 per cent of their current pay package. Not long ago, many airlines including SpiceJet were luring the same pilots and engineers with joining bonuses and better perks. Jet Airways Stops Forward Booking for East-Bound International Sector. 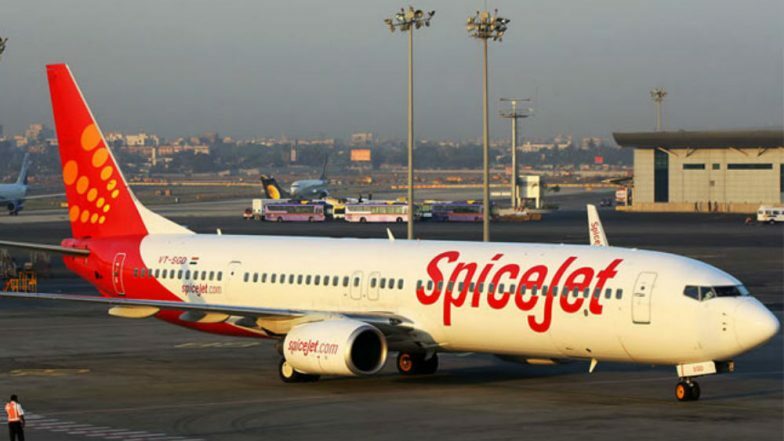 A SpiceJet executive said that the budget carrier was offering salaries based on their own structure and not the highly inflated one paid by Jet Airways. A senior commander with Jet Airways said that pilots with 4-5 years of experience are going to other airlines as they are feeling the pinch of salary delays. Jet Airways Currently Flying Less Than 50 Domestic Flights, Says DGCA Official. "We will have to train them for flying and maintenance of Airbus aircraft. In case of pilots, it will need six months of training while for engineers the reskilling would take 3-4 months. This means the salary for entire training period will be a huge cost for us," said an executive of a private airline operating Airbus planes. But aviation experts feel that the current situation is temporary and it will be normalise once Jet gets back on its feet. Jet Airways Aircraft Seized in Amsterdam For Non-Payment of Dues, Passengers Stuck.